Kelly began learning karate in late 1950s. His father studied at one of the first karate schools in Ottowa, Canada, and at this time, training was adults-only. So his father trained him until Kelly was 10, when a kid’s class became available. 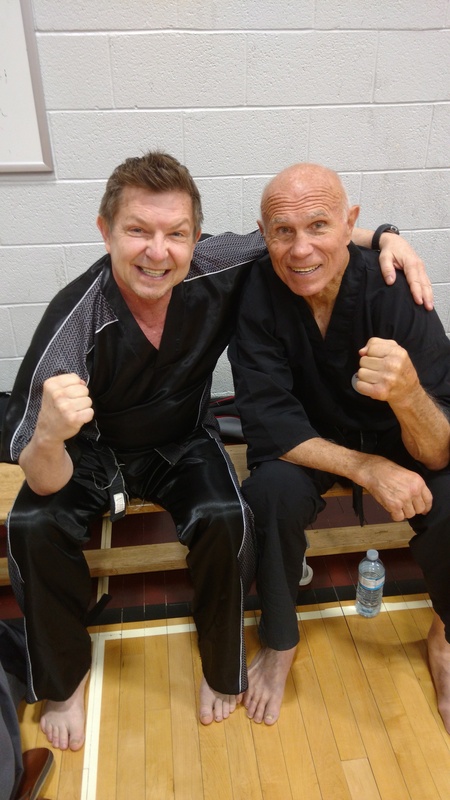 Today, just into his 60s, Kelly is not only still training – but competing in point-fighting karate, while making time for a career as an author and working to promote a noble cause: PTSD awareness. A while ago, I was able to conduct an interview with Perry William Kelly. No matter what your current age or training status, if you need some inspiration, you need to hear his amazing story, in his own words! The CENTURION: So, were you always interested in martial arts, or did you start training because you saw your father doing it? PERRY WILLIAM KELLY: Well, when I started training, the James Bond craze of the early 60s, with him doing martial arts, was in full vogue. And also, around that time was when Green Hornet was first on. So of course, I was enthralled by Bruce Lee, and it was my avenue to pursue martial arts, that fascination with it. C: After living in one of the more dangerous of Canada as a teen, you started training more combat-focused arts. You later went on to pursue a law enforcement career. Would you say your martial arts training helped you in this regard? PWK: Well, interestingly enough, I had wanted to be a police officer. But at the time, you had to be at least 5’10” to be on the local force and 5’8” to be in the Royal Canadian Mounted Police. Being vertically challenged, I wasn’t able to do that. So I pursued a career in criminal justice instead, working in the correctional service, as an investigator, and afterwards I was the head of the SWAT teams. My martial arts background and my legal training worked nicely with my career choice. C: What did you do as the head of SWAT? PWK: Well, I was head of the Emergency Response Teams for Correctional Services of Canada. While in that position, revamped a lot of the way they did business so they would be more in line with what I saw was coming from the United States. Being more litigious, we had to do things in a more professional manner, such as video taping, and doing things on a more professional basis. It was also at that time that I met my instructor, who later become my partner (on the force) in a class that we were teaching. He was the instructor for our Special Forces, and a lot of our operators would come in and train with us in muay thai and Filipino kali. C: Speaking of kali, you trained under Guru Dan Inosanto, a kali and Jeet Kune Do master and contemporary of Bruce Lee. As remarkable of a training experience as that was, in a way, it’s also what sparked your writing career. PWK: Well, it was kind of an interesting journey. When I was in law school, I ended up, through one of my contacts with the Canadian police college, publishing an article on polygraphs. That was my first published article. And from there I started writing for the Royal Canadian Mounted Police Gazette, on police officer survival. (Those articles), I turned into a book. Having trained with Guru Dan Inosanto, I asked him why no one had ever written a biography about him. 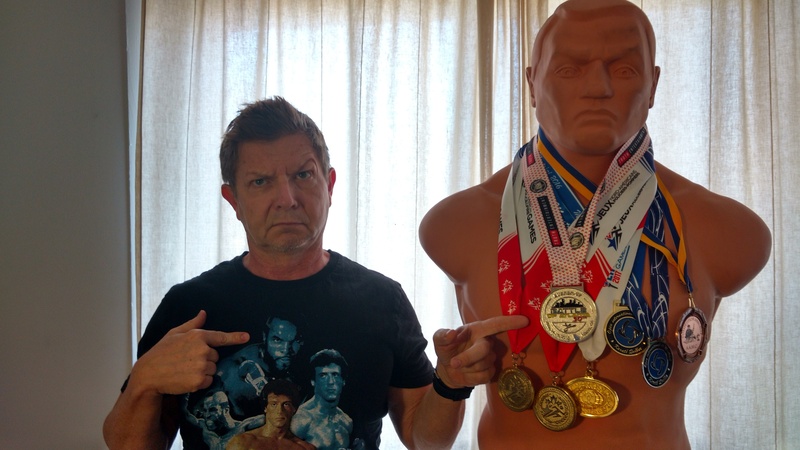 And, as self-effacing as he is, he said, “Well, do you think people would be interested?” And I went, “Yeah!” So I spent the next five years traveling around North America, interviewing him when I could, and that resulted in the Dan Inosanto biography. C: That was the first martial arts book you wrote. And the next? PWK: That was another lucky coincidence! At me party for the Dan Inosanto biography, former world kickboxing champion Jean-Yves Theriault, whom I’d known since I was a teenagers because my dad used to work as one of his promoters, came to the event. We said, “You know, Jean-Yves, we should really do a book about you!” and that resulted in the Iceman book that I wrote. C: When did the competition bug bite you? 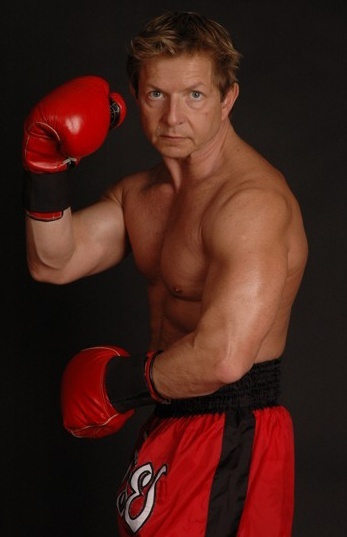 PWK: Well, I retired at the age of 57 and was looking for something to pursue on an athletic basis. I learned that there were age-specific karate tournaments, so I figured this would give me a chance to get back to my original roots, and also see if I could employ a lot of the movement patterns, strategies and techniques, especially footwork, from other martial arts I had learned. Kelly is racking up the medals for competition -- including silver in 60+ sparring at the recent 50th Battle of Atlanta, in June 2018! C: How do all the different arts you know blend together in point-fighting karate? PWK: Well, as (Bruce Lee) said, a punch is just a punch was just a kick is just a kick. Combat is combat. Using distractions, being able to employ feints, being able to move in an athletic and combative manner safely goes across all striking sports. So movement patterns from muay thai or boxing may be slightly different from those used linear karate, but that works to my advantage because my opponents are used to seeing things in a straight line. C: Did you have any hesitations about jumping back into competing? And if so, how did you overcome that? PWK: One of the biggest emotions I faced was self-doubt. (When I got back into competition,) I hadn’t done sport karate for 45 years. But I realized that yes, the rules (of sport karate) are a little different, but the things that I had been doing over the years could definitely have some overlap. So I said, “Why not me? Why can’t I win it all?” That was the overcoming of the trepidation. C: What does a typical day of training look like for you? PWK: Well, it depends. I learned that I have to train smarter, rather than harder, at my age. Many people involved in athletics train at too high a level year-round. They go all-out all the time, which results in them either getting sick or injured or burning out. My training is kind of laid back, doing what I feel like doing. As I get closer to competitions, I will take stock in which physical attributes – whether that’s cardio, strength, explosiveness, or whatever, that I have to work on, and I’ll focus on sport-specific training. C: Who or what inspires you? C: You also work to raise awareness of PTSD. How did that particular cause catch your attention? PWK: I have two friends, one who was a peacekeeper in the former Yugoslavia, in Kosovo, who is living with PTSD. I also have a very good friend whose best friend was ambushed and killed in eastern Canada a couple of years ago by a gunman who killed four RCMP officers. Both of them are dealing with that. And I also, having working in the correctional system, deal with with my own flashbacks and own recurrent PTSD dreams. I figured, you know, that with my athletics as a platform, I could raise awareness for this issue. C: What do you want people to understand about PTSD? PWK: The mind, the brain, is just another organ of the body. People think… that you can simply just “pull yourself up by the bootstraps,” but sometimes, you do need counseling and/or medical intervention in the form of drug therapy to deal with these things. This includes post-partum depression! It’s a huge problem, but new moms are under that stigma not to get help, even though we know that somewhere like 40% of women suffer post-partum depression. C: As we all know, physical and mental health are closely related. Can martial arts itself be used to help manage PTSD? PWK: Oh, definitely. Any time I’ve had any particularly huge stressors in my life, whether that be loss of family members, loss of a job, marital discord or anything of that nature, I’ve tried to use a physical, mental, and spiritual element to address that. Martial arts provides all three. Working out raises your endorphin level to make you feel better, and also you can get a sense self-awareness. Learn more about Perry William Kelly and his work on his site, PerryWKelly.com! And be sure to check out a column featuring him in the upcoming November 2018 issue of Martial Arts Success Magazine! There are many possible causes of PTSD, including trauma suffered in the line of military, police or first-responder service, sexual assault, childhood abuse, involvement in an accident or disaster (natural or manmade), or the sudden death of a loved one. PTSD symptoms don’t always appear immediately after a traumatic event. They typically appear within three months of the trauma, but may not surface until years later. Remember, PTSD is not your fault and there is help. The sooner you receive assistance, the more you can reduce your symptoms and the better-prepared you will be to handle your PTSD in the future. The US Department of Veterans Affairs website offers many tools for those with those with PTSD. The site offers resources for veterans and civilians, including more information on symptoms, help finding a therapist, and more.